How Long haven't You Shared Your Time with Your Kids? Aimerday Kids Table & Chairs Set, Give You and Your Children a Happy Parent-Child Time! Safety Guarantee: Nontoxic, harmless, odorless and no risk of hitting pain. Stable & Sturdy: Sturdy and durable EVA material with high stability. Easy to Install & Dismantle: Finish the installation and disassembly by your hands and strength without extra tools. Lovely Pattern: Designed by independent designer from Aimerday and you'll get a unique table and chairs set. Quick to Clean: Just wipe them with wet cloth after using. Storage Box Provided: High quality box will be sent together that you can use it to storage. JOIN US NOW AND ENJOY THE LIMITED TIME DISCOUNT! ✔ PROVIDE THE GREATEST PROTECTION: Aimerday Table & 2 Chairs Set with SGS, UL, 3C Certification is completely free from BPA, phthalates, lead, formamide, chrome and latex, it's absolutely non-toxic, harmless and pollution-free. And unlike those hardwood table and chairs, the environmentally friendly foam material will not hurt your child when a collision occurs. ✔ DURABLE MATERIAL & SUITABLE SIZE: Aimerday Kids Table & 2 Chairs Set adopts high grade EVA material which is sturdy enough to endure the weight of 220lb, it could last for years of use without losing their shapes. The size of table is 20"x16"x17" and the size of chair is 10"x10"x9" when assembled, perfect size for preschool kids to eat, read books, do arts and crafts, play board games, or just have fun. ✔ UNIQUE SPLICING DESIGN & PATTERN: Aimerday Table & 2 Chairs Set with easy snap-together assembly design is fully convenient and easy to assemble, you just need to follow our installation steps and install the product with full strength. 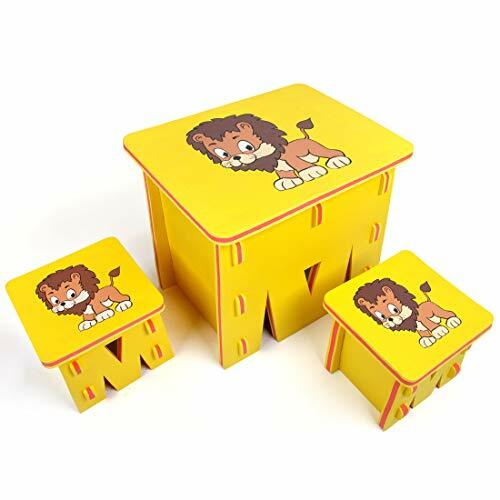 And the bring yellow color and the lion pattern are sure to be loved by your kids, ideal for your toddler's bedroom, playroom, or living room, kitchen, daycare, nursery. ✔ EASY TO CLEAN & PORTABLE: Don't worry about the cleaning issues after using at all! Just wipe the table & chairs with wet cloth, then they will look like new. And disassemble the table & chairs set and put the dismantling mats in the carton provided when you want to take them out. Aimerday Table & 2 Chairs Set is lightweight and space-saving, you can take them anywhere such as park, beach, picnic, activities. ✔ BEST GIFT & 5 STARS CUSTOMER SERVICE: The most delicate present for kids to enjoy learning and playing time whether indoors or outdoors. And within 90 days you bought our items, we accept your return for full money refund. Our goal is 100% satisfaction of after-sale service. ORDER NOW you will get a unique Aimerday Kids Table & 2 Chairs Set! If you have any questions about this product by Aimerday, contact us by completing and submitting the form below. If you are looking for a specif part number, please include it with your message.